This page describes several common database administration and reporting tools that you can use to connect to your Cloud SQL instances. Database administration and reporting tools provide varying degrees of support for managing your database. Select a tool based on what type of administration and reporting you need to do. 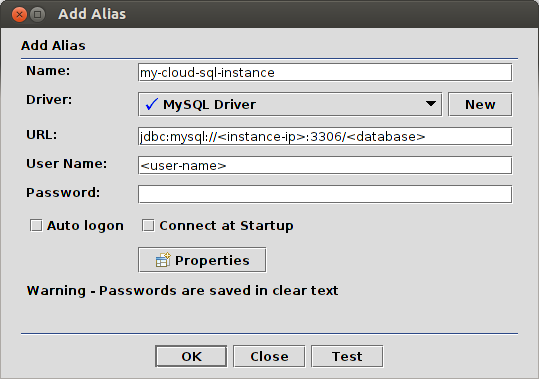 For example, if you need to connect to one database and issue a few SQL commands, consider using MySQL client (see Connecting MySQL Client Using IP Addresses). If you need to design or manage many databases simultaneously, then use one of the visual-based tools discussed here. We discuss a limited number of tools in this page, but, if your tool is not shown below, it is likely that you can follow the steps for a tool that is similar and successfully connect. This section shows how to connect to your Cloud SQL instance database with MySQL Workbench. In the Setup New Connection window, provide a Connection Name, Hostname, Username, and Default Schema, if applicable, as show in Figure 1. Figure 1: Specifying parameters in the MySQL Workbench Setup New Connection window. Figure 2: Specifying advanced options in the MySQL Workbench Setup New Connection window. 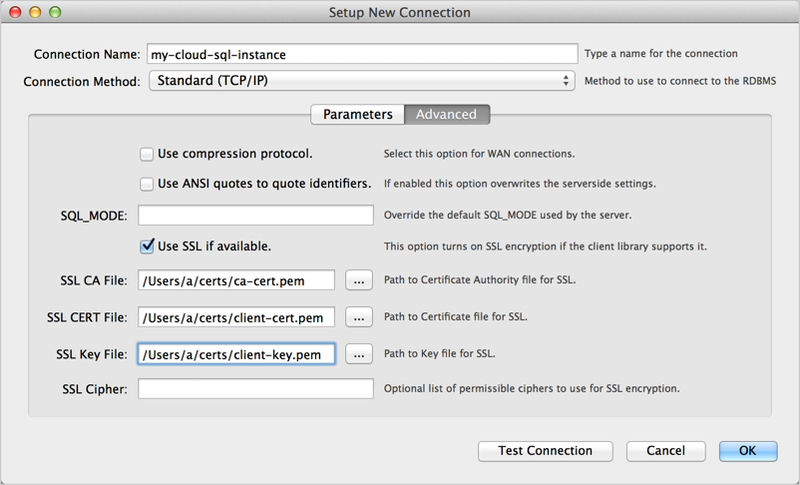 Figure 3: Testing if the MySQL Workbench connection uses SSL. This section shows how to connect to your Cloud SQL instance database with Toad for MySQL. In Toad for MySQL, create a new connection. User - the name of a user in your MySQL database. Password - the password for the specified user. Host - the IP address of your instance. For more information, see Configuring Application Access Control. If you have mapped the IP address to host name for your local server, you can use that in this field. Database - the instance database to which to connect. Click Test Connection to confirm the connection information is correct. Click OK to start the connection. In the Enter Password dialog, enter the password for the user. This dialog appears because we did not choose Save password (encrypted) in the Create New Connection dialog. 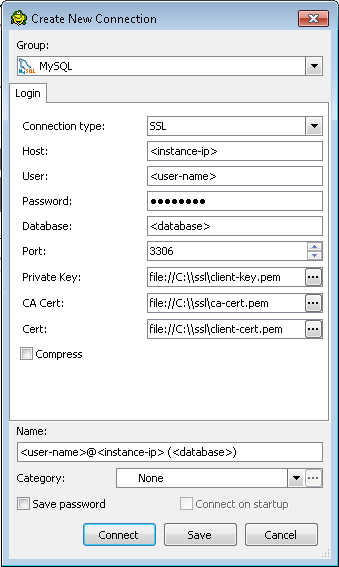 In Figure 5, a Create New Connection dialog box is shown with the information for connecting with SSL. Note that not all versions of Toad may support connecting with SSL. This section shows how to connect to your Cloud SQL instance database with SQuirrel SQL. In the SQuirrel SQL client, select the Aliases panel to make it active. In the Aliases menu, select New Alias. Fill out the information as shown in Figure 6. 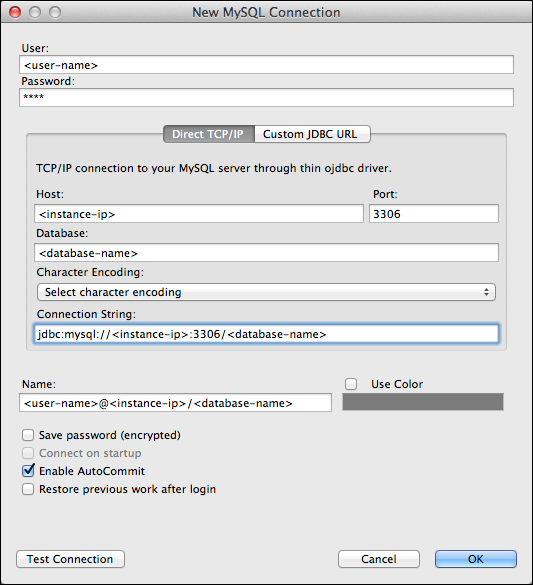 Be sure to select then MySQL Driver and provide values for <instance-ip>, <database>, and <user-name>. Note: The connection URL for using SSL is of the form: jdbc:mysql://<instance-ip>:3306/<database>?verifyServerCertificate=true&useSSL=true&requireSSL=true. However, to use SSL you must specify truststore files created from the CA certificate, client certificate, and client key you obtained when you created an SSL certificate. For more information, see Configuring a SQuirrel SQL connection to use SSL. Figure 6: Configuring a SQuirrel SQL connection to MySQL. Click Test to test the connection. You will be prompted for a password. Click OK to save the alias. In the Aliases panel, right-click the alias you just created and select Connect. A CA certificate file, for example, ca-cert.pem. A client public key certificate file, for example, client-cert.pem. A client private key file, for example, client-key.pem.